With the global real-world evidence market projected to grow by 2023 and continued investment in advancing RWE-based outcomes and value, pharma needs to collaborate and work cross-functionally between clinical and commercial to identify gaps in evidence generation and successfully accelerate the successful bringing to market of efficient drugs and demonstrate their value. If you want to be at the centre of a comprehensive discussion around how RWE can and is supporting product lifecycle strategy, drug development and commercialization activities, join the community of like-minded professionals at the 6th Annual IMPACCT: RWE. development to commercialization of their products. We know the value of case-study led discussions. That’s why at the IMPACCT:RWE Summit we’ve tailor-made an agenda that contains over eighteen case studies around how real-world evidence is currently being applied across the drug development continuum to support decision-making in clinical development, drug marketing and commercialization, and how you can define and develop a comprehensive evidence generation plan that supports activities from clinical to commercial. You will have a chance to discuss with peers and learn from thought leaders in the industry such as Lundbeck, Biogen, BMS, Amgen, GSK, Pfizer and more. With a room full of senior drug development and commercialization professionals striving to effectively leverage real-world evidence to benefit patients, this summit is your chance to meet like-minded industry peers to shape the future of RWE together. 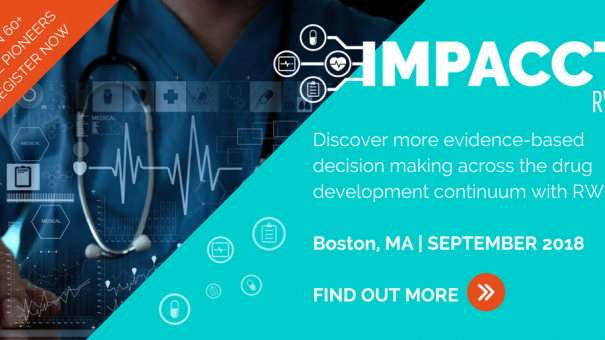 In a highly engaging and interactive discussion, you will learn decision science basics, including implementation examples. The group will also explore opportunities and strategies for RWE to leverage decision science as a vehicle to achieve greater value by informing and helping to change drug development and commercial decision making within your organization. The community gathering at IMPACCT: RWE will discuss the latest RWE-based use-cases, innovative approaches and learnings. Delve into how RWE is impacting and transforming clinical development, outcomes, market access and reimbursement strategies. Are you in? Secure your place Today and Save with Early Bird Rates! Take a look at the event guide here to find out more.